Facing a criminal charge in Ontario can be a scary ordeal. That experience becomes even more stressful if the offence in which you are detained for requires that the police hold you for a bail hearing. An unsuccessful bail hearing means that you will be spending time in a narrow jail cell until you’ve had your final day in court. Making bail can be a difficult process. Our team of knowledgeable Oshawa bail hearing and criminal lawyers can be your ticket to freedom as your matter progresses in court. Our lawyers have simplified the process of conducting bail hearings and we are pleased to say that this content is 100 percent FREE! 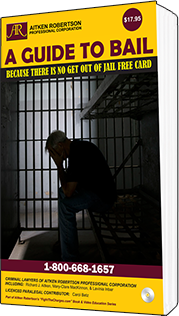 If you or someone close to you is being held for a bail hearing, please fill out the form below and request a free digital copy of our newest book: A Guide to Bail – Because There is No Get Out of Jail Free Card. This book also doubles as everything you need to know if you are the surety for an accused person facing criminal allegations. If you want to speak with someone immediately, we recommend you call 1-800-668-1657 and one of our criminal lawyers will take your call and answer any questions you may have. For more information concerning bail hearings, click here. AssaultDrug Possession/TraffickingDUIMischielfFraudYoung OffendersOtherNo charges, but still interested.